Over 3600 people are confirmed dead after a 7.9 magnitude earthquake struck Nepal on 25 April 2015 leaving massive destruction in its wake. The Lutheran World Federation (LWF) has launched an immediate large-scale emergency response with its emergency team already in place in the Kathmandu LWF offices, which have escaped the worst impact of the quake. The LWF is currently working together with the Nepalese government, the United Nations and church partners in the ACT Alliance network to coordinate the response. Staff on the ground are preparing to distribute immediate life-saving supplies, such as water, food, shelter and medication to those affected. Please donate to support LWF emergency response. Mark your donation "Nepal". Download the ACT Alert from the Nepal Country Program Website. At the end of 2006, Nepal emerged from a decades-long civil conflict. However, armed criminal groups continue to have a significant impact on the security of the country, primarily in the southern districts. The Nepalese economy is rooted in agriculture. Seventy percent of the population relies on agriculture as their primary income and food source. Approximately 80 percent of the population lives in rural areas. Like many other countries in South Asia, Nepal is vulnerable to natural hazards and disasters, such as floods and droughts. We assist vulnerable people through a variety of community-based programs. We work to build up local capacity on disaster risk management through village and district level committees. We also distribute practical supplies like rubber boats and life jackets in flood-prone areas. The LWF provides livelihood and relief support to Tibetan settlements and Bhutanese refugees at two camps in eastern Nepal. We also respond to smaller-scale disasters like the nearly 400 fire-affected families in Saptari district in 2010. In a long-term perspective, the LWF promotes farm-based enterprises and cooperatives. We also support youth with general skill development and lessons in starting small business. We are continuing our financial support and collaborative efforts for evidence-based advocacy. Help us make a difference in the lives of people in need in Nepal and other places throughout the world. Member church celebration, humanitarian and development work and interfaith relations are part of the LWF General Secretary, Rev. 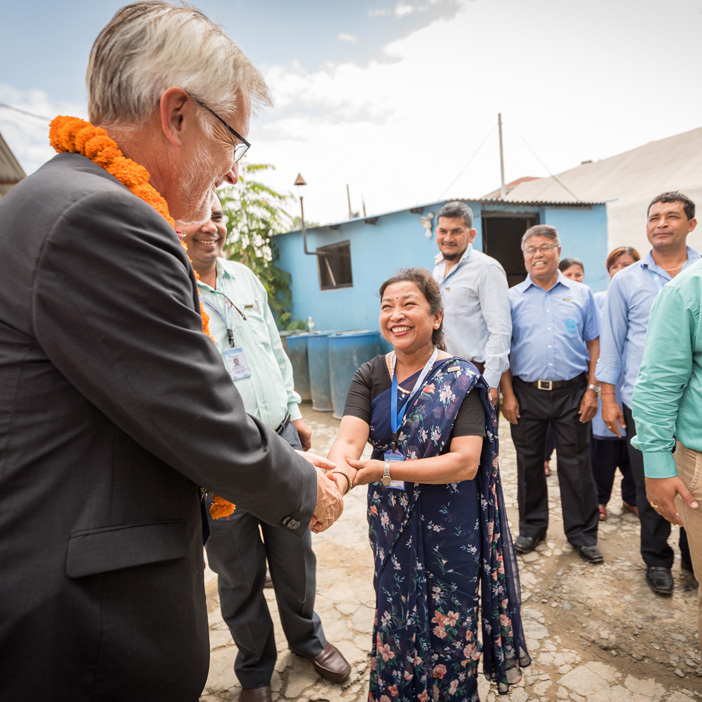 Dr Martin Junge’s, visit to Nepal from 13-19 September 2018. Program highlights include his participation in the 75th anniversary celebration of the Nepal Evangelical Lutheran Church, an LWF member church, and visits to the LWF humanitarian work. These include a Bhutanese refugee camp in Eastern Nepal, and a village in Kavre district, where LWF has been supporting the local population with humanitarian aid and reconstruction after the devastating earthquake in 2015. Over the past three years, LWF World Service has supported communities recovering from the 2015 earthquake, which struck with devastating effect. On his visit to a Bhutanese refugee camp in Nepal, Rev. Dr Martin Junge, general secretary of the LWF, has advocated for a durable solution for the close to 6,700 refugees who still remain in the country. Bridging the gap: Interfaith development work in Nepal "an eye-opener"